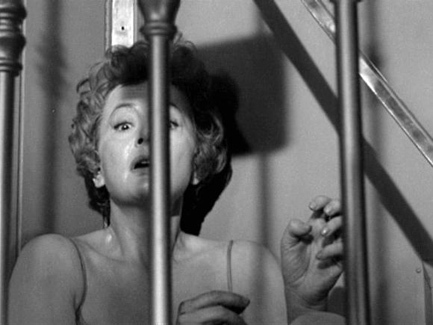 Stark and highly suspenseful, Lady in a Cage is a surprisingly lurid and at times brutal thriller from the 60’s. Parts of it reek of being dated and melodramatic, but I was still surprised by how effective and shocking this movie was at keeping me on edge like all good thrillers. Mrs. Hilyard, a wealthy widow is recuperating after breaking her hip. To get around her house better, she has had an elevator installed to help her get between the two main floors. With her son away, who she often mollycoddles a lot, Mrs. Hilyard attempts to find something to take her mind off being alone. But when she uses the elevator, which at times resembles a cage, a power failure causes it to stop midway and she is left trapped. She tries to call for help but no one seems to come. That is until the homeless alcoholic stumbles into her home and instead of helping her because of his addiction, steals some of her belongings. He proceeds to visit his only real friend, the weary prostitute Sade. Both are desperate for money so they return to the house to see what else they can hawk for cash. The duo gains the attention of a violent troika of teenage hoodlums; savagely brutal leader Randall, lecherous Essie and violence loving Elaine. The teenagers cotton on to the idea of money and riches and follow George and Sade to the house. Meanwhile, Mrs. Hilyard is slowly beginning to crumble in fear and things get a whole lot worse when Randall and his posse arrive and indulge in games of violence and torment with her, and Sade. Can this civilised and well-bred woman manage to survive the ensuing brutality around her and free herself from the eponymous cage? Walter E. Grauman coats Lady in a Cage in a bleak and unforgiving light, that makes the events that transpire even more horrifying. Themes of indifference and cruelty are explored with a lot of dramatic impact generated. The fact that when Mrs rings for help no one seems to notice taps into society’s culture of being to busy to notice important things and it is presented against the backdrop of savagery that soon invades her house. 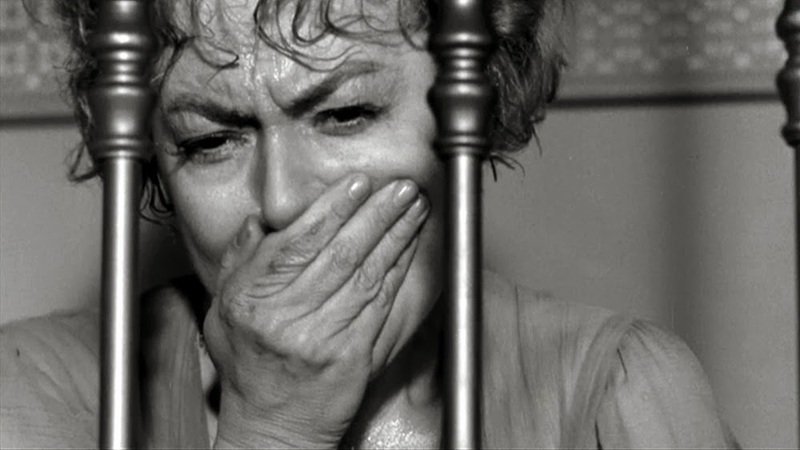 The stark and at times harsh black and white cinematography is used to terrifying effect as it brings more darkness to the film, despite the events all taking place over a sunny day. Now it must be stated that Lady in a Cage despite holding up well in various areas, does have parts that have dated badly. The main instance is the inner monologue of Mrs Hilyard, which seems like a good idea but eventually becomes more than a little repetitive. In other instances some of the film gets a bit histrionic, but thankfully due to some of the content that is still shocking today it succeeds above these two flawed elements. A shifting score of tempo and volume ushers in uneasy feelings for the characters and audience. 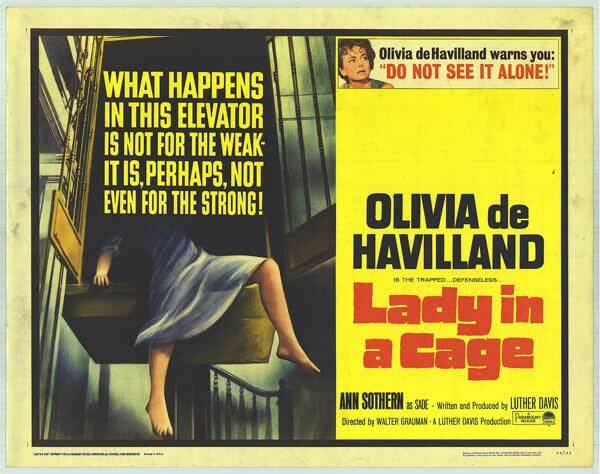 Olivia de Havilland is excellently cast as the trapped woman of the title. Through her performance, we as the audience share her suffering and turmoil as her civilised world is torn apart and she must fight to survive the carnage. Sympathetic, desperate( as evidenced by the fact that Mrs Hilyard makes her own conversation to alleviate her panic) and traumatised, yet still holding on, de Havilland is oh so marvellous in the part and she displays such tangible emotions that we can’t help but want her to live through the terrifying plight she endures. In his first really substantial film role, James Caan is disgustingly evil as the leader of the gang who delight in terror. He really strikes fear into the heart of this film and many of the shocking events unfold as a result of his character’s cruelty. Jeff Corey and Ann Sothern manage to make their characters, who are in essence thieves sympathetic, because they may break into the house but their violence and means are nothing as vicious as the trio of demented teenagers. And speaking of the horrid teenage hoodlums, Jennifer Billingsley and Rafael Campos as the loyal followers in the gang are equally as creepy and filled with disturbed menace. A thriller film that isn’t afraid to be shocking and disquieting, Lady in a Cage showcases talented acting and dark subject matter in a highly compelling and difficult way. Archaic as some of it is, one can’t deny the power of the film and what it taps into. Who knew a movie from such a long time ago could still retain a brutal impact? Another awesome review brother 🙂 I’ve heard of this film before. I’m certain I’ve not seen it but I actually knew the premise before I read this….I can’t remember where I heard about it though!! It surprised me with how much the darkness of it still holds up today. I found the movie on Netflix. I didn’t know about this film at all, V. Worryingly, I like the sound of it. The cast looks good, and the plot idea appeals too. It is £25 on Amazon though, so I might have to wait for a reduced price, or a free showing on TV. If you have Netflix, you can find it on there Pete. Rather than paying that much from Amazon. No Netflix (or any Internet TV) in the Pete household, V. I might be able to watch it on my step-daughter’s tablet though. I’m sure that’s one way to see it Pete. Great review once again, man! Thank you, that’s nice of you to say. Nice job, Vinnieh. I need to rent this! It’s definitely worth the watch. Oh! This sounds quite good. I love Olivia de Havilland and Ann Sothern! Both of them are on fine form here. You’ve analyzed this film well and you’re right despite the melodramatics it’s still an effectively stark picture. Hats off to de Havilland for taking on what was considered at the time a very daring role for an established actress. BTW, she is still living and will be turning 100 on July 1st! Nearly 100 you say? Wow that’s amazing. Speaks well to James Caan and his talent as an actor that he can play menace as well as being menaced (Misery). Oh most definitely, thanks for reminding me I need to watch Misery again. The premise sounds pretty interesting; even though you state it’s a bit outdated. So I guess it hasn’t aged that well, unlike some great classics, that surpass time. I’m keen on checking out though!! Only parts of it are dated, it actually remarkably holds up quite well. I have to say this sounds like a really bizarre and nasty film. It might be an idea for me to watch it after a few beers! It does get very violent and unnerving in many cases. I was surprised it was still quite shocking now.